If your ricotta is too wet, put it in a colander and let it sit for a while to dry out slightly. Boil the greens separately in well salted water until cooked through. Drain, cool and squeeze the greens until as dry as possible. Either chop by hand very finely or, easier still, whizz in a blender until very fine. Season lightly with salt. Put your ricotta in a big bowl, add the mixed greens, parmesan, salt, pepper and a good grating of nutmeg. Exact proportions are difficult - you have to keep tasting until a nice balance is achieved. You may need more cheese grated, nutmeg, salt or pepper depending on your ricotta and your greens. When happy with the seasoning, pour a good layer (at least 2cm deep) of semolina into a large tray, and a 4cm layer of semolina into another large tray with deep sides. Roll a ball of the ricotta mixture in your hands - it helps if your hands are clean and dry, and try not to get any semolina inside the mixture at this point. You are looking for a ball of about 2-3cm diameter, certainly no bigger than 3cm. Next, roll the ball of ricotta gently in the semolina until completely coated. Try to keep the shape intact. When your gnudi is made, place into the second tray, leaving a good space in between each gnudi. When there is no more room in the bottom of the tray, pour a second layer of semolina into the tray to cover the gnudi you have already made. Continue until all your mixture is used up. Make sure that all the gnudi in the deep tray are buried completely in semolina, and that they are not touching each other. Cover the tray and place in the fridge for at least a few hours, preferably overnight. After the gnudi have had time to firm up, place a large pot of salted water on to boil. When boiling, remove the gnudi from the semolina tray, lightly tapping themi in your hands to remove excess flour. 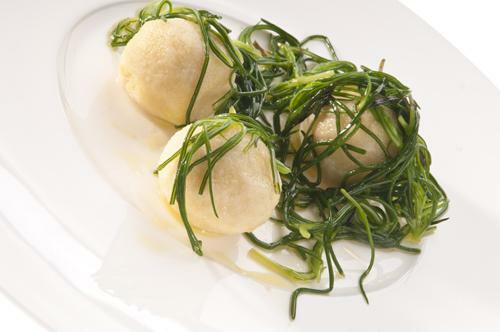 Drop the gnudi into the water and boil for about 20-30 seconds, or until they start to float. Remove with a slotted spoon or a spider into a tray. With a small spoon (the gnudi are very delicate! ), transfer the gnudi to a warm plate. Five gnudi is a nice portion we think. Pour over your best Tuscan olive oil. Be generous.